Bruce Geer, right, places a bell representing one of the 39 local homeless people who died this year. The word on the street is that Soda Pop fell into a mud puddle about four inches deep and drowned. They called him Soda Pop because he always had a can of beer in his hand. He was a "happy drunk," a mentor to the younger men and "an icon for flying the sign," as his friends put it. On Bloomsday, he stood on a corner with his sign for 25 minutes. He came back with $107. And he always shared what he had. "If he had food and you were hungry, he'd give you something to eat. If you were thirsty, he'd give you a drink. He was just that kind of guy," says "Little Doug" Siebold. Little Doug lived under the I-90 overpass with Soda Pop and 30 other men until they were kicked out by police a couple of years ago. "I don't think the majority of people realize what it's all about to be homeless," he says. "It's not fun, but it will teach you something about yourself. You learn to love yourself, and I know Soda Pop did." Soda Pop's real name, his friends on the street later found out, was Charles Tye. He was from Detroit, and he was a veteran. During his last months, he knew he was dying. This made him gentler, says Little Doug, "more of a real person." Soda Pop was one of at least 39 people who had experienced homelessness who died in the past year. 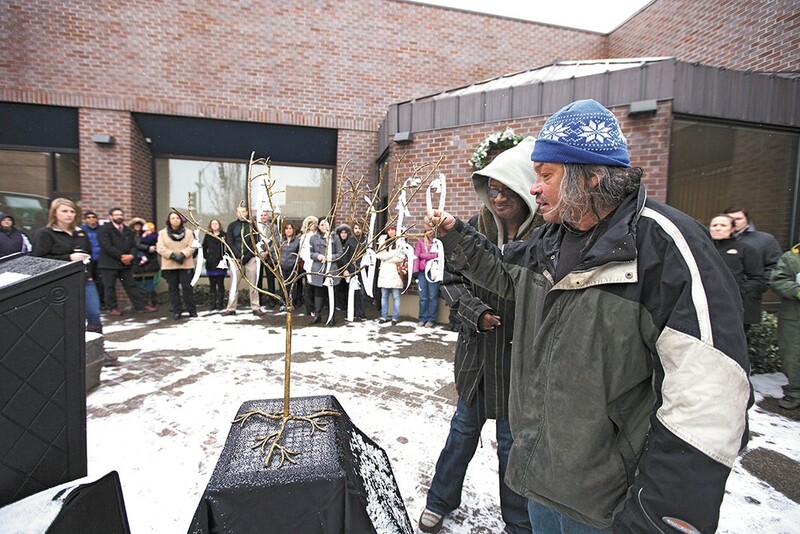 Last Friday, they were honored at the CHAS Denny Murphy Clinic as snow fell steadily and cold in the courtyard, where 50 people gathered in remembrance. For these men — and they're mostly men — there were no obituaries in the newspaper, often no graves to mark their burials or next of kin to call. Even on the streets, few people knew who they were before they became homeless and anonymous. As such, their stories remain unknown. "I can't remember all of them. There have probably been 20 or 30 since I've been on the streets," says Little Doug of his friends who've died since he became homeless in the '90s. Each person who passes is a reminder of his own mortality: "It could be me." 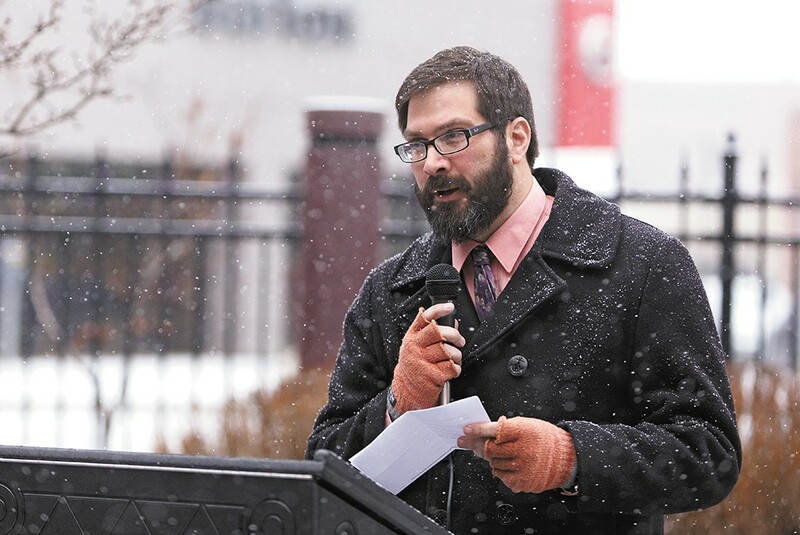 CHAS clinic physicians assistant Bill Bomberger at last week's memorial. They die young — from alcoholism, drug and tobacco use, exposure and violence. But most of the time, chronic health conditions take their final toll. According to the Spokane Regional Health District, living downtown decreases one's life expectancy by up to 18 years. "We do whatever we want to do," says Little Doug. "It's the most freest you can be." For Aaron Weeks, it was diabetes, House of Charity workers say. For Phillip Waldron, it was heart failure. Darnell Perkins was on hospice at the end. Kace Perry and Nicholas Kittridge OD'ed. Cyrus Jones was shot in the chest. Ramona Childress was stabbed, her body found buried in the woods. For service providers, the list is far too long. The deaths don't get any easier. "We're in the business of attaching to people," says Jerry Schwab from the House of Charity. "We want to be emotionally connected to our folks, because that's real. They need that, and they prosper from that. That's how they move forward. Then when they die, that's painful." Pops collapsed inside the Conoco on Third. He was leaning against a shelf when his heart gave out, say those who knew him. He died within minutes. In the South, where he grew up, he was Matthew Bolar. In Spokane, he was known for his music. He said he was a cousin of Sam Cooke, the legendary King of Soul, and he could play the piano like nobody's business. "He had a heavenly voice, a lot of soul," says Schwab. Pops lived in a RV that he moved all over downtown, until the pastor at All Saints Lutheran gave him permission to leave his vehicle in the parking lot in exchange for janitorial work at the church. An advocate for the homeless, he volunteered at service organizations all over the city. You didn't want to mess with Pops. He spent 13 years in prison. He kept a knife on hand in case he needed to fight. But when Pops died last spring, his memorial service was packed. "Sometimes a street person passes and not much of a dent gets made in the social order. When Pops passed, a huge hole was left for many, many people, street people and others," says Rob Bryceson, pastor at First Covenant Church. "I miss him." Rick "The Rocket" Rinehart died in August from liver failure. His body was found by the train tracks across the street from Grocery Outlet on Fourth. That was Rocket's post, beneath the overpass. He'd lived on the streets almost his entire life, and his reputation was mean. Rocket was a loner and a hell-raiser, illiterate and an alcoholic, recall local volunteers. He'd walk into the City Gate for a meal, black and blue and wasted. He lost his sight in one eye after he was hit with a pipe. For Rocket, his homelessness was a source of pride, a badge of honor. But inside the City Gate, "he was a completely different person." "He'd give you the shirt off his back, but he was smart enough not to let people on the streets know that," says Andra Phelps, PR coordinator at the City Gate. She met Rocket when she started volunteering at the City Gate 20 years ago. "He happened to be one of the very handful of people who I felt safe with." He called Phelps "sweetheart" and asked her about her family. He walked Phelps to her car at night. When Rocket died this fall, the staff and patrons at the City Gate held a memorial for him at his post under the overpass, marked by a painted rock ("Where do souls go to soar?") and a bottle of Bud. They all sang his favorite song: "I'll Fly Away."